Hot on the heels of the image snapped a week ago, a video emerged from the weekend taken by a Rob Jones which the Scotsman newspaper ran. What is shows is an animal nonchalantly swimming away from a cruiser boat as they cross paths and both eventually disappear from view. Now, one may just dismiss this as a swan or cormorant, especially since Nessies are not known for hanging around boats in a relaxed manner. So the one thing that intrigues me is the possible size of the object. We have a scale here as you would have noticed the man on the boat watching the animal swim away from it. The visible portion of the animal looks almost as tall as the man. Now I know there is the matter of perspective which can make objects closer look bigger than those further away. So the matter is to be resolved by the man (or woman) on the boat. What do they think they saw from their prime vantage point? A simple bird or something else? I hop he was recording whatever is was! However, the Scotsman theory it was a log looks rather far fetched. One other possibility is that someone is playing games (or experiments) here as we noted in our previous article the curious picture that turned up on the same day in the same area of Urquhart Bay. Watch this space I guess. POSTSCRIPT: An interesting analysis of the video can be found here. 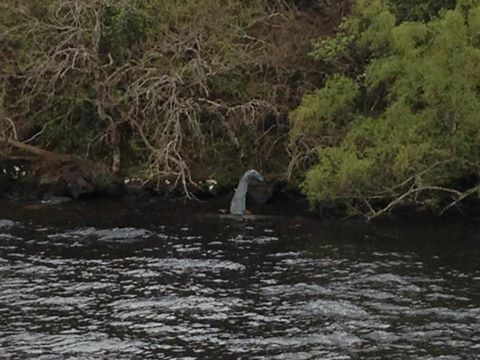 After being posted missing for months without a sighting, tourists have captured new video of Nessie..although it may have been a log. Rob Jones, 35, from North Wales, shared the footage taken on Sunday of a mysterious shape moving across the Loch. A large group of tourists watched and took pictures as the object moved slowly close to a passing boat before disappearing. 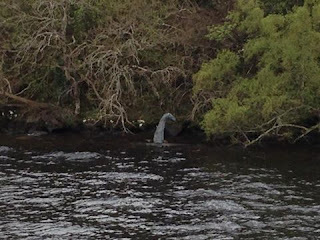 After being posted missing for months without a sighting, tourists have captured new video of Nessie..although it may have been a log. Rob Jones, 35, from North Wales, shared the footage taken on Sunday of a mysterious shape moving across the Loch. Every year, I leave some trap cameras strapped to trees as silent sentinels monitoring the ever changing waters of the loch. This year I upped the count to five cameras and will continue to add more as time and money allows. I am still working through the thousands of pictures they snap, but show you today what they have seen. Watching the surface of Loch Ness for things of cryptozoological interest is largely a thankless task. If anything appears beyond a certain point, you may get your own personal experience and even get a clear view through binoculars, but the resultant camera image is not likely to be decisive in the Loch Ness Monster debate. The trap camera paradigm solves that issue by only snapping object within about twenty metres in accordance with the sensitivity of their motion or heat detection systems. Clearly, if the creature puts in an appearance at that distance to an 8Mb or 15Mb pixel resolution lens, we will likely get something of considerable interest. The cameras are also configured to take three pictures in succession to provide further data in examining any objects that come into view. I have decided that taking video clips is not a generally good idea as the video clips are not of a good quality and only last 5 seconds lest they consume the entire SD card in a matter of weeks! Having said that, one camera is set for combined picture and video. Of course, in the process of taking thousands of images, something may randomly appear further out, but I am not pinning any hopes on that and it is not the main purpose of the venture. With that said, here are some examples of images taken this year. Ignore the date and time in the image, they are miscalibrated. Firstly, a typical view of the loch from this camera. Waves rolling in to break below the camera, branches gently shaking and green hills beyond. All set to catch the usual and unusual. Click on each image to enlarge them. The next sequence shows the "three rapid shots" setup as some kayakers slowly make their way in front of the camera. However, some things are just too fast, even for an automatic camera. This shot shows the trailing wake of either a speed boat or a rib boat or something like that. Of course, it could be a Nessie, but that would require calculating the speed it requires to clear the lens without detection. For now, its a speed boat! In terms of night shots, clarity of image will be compromised by the lack of light, hence the infrared component will flash a series of LEDs in the infrared spectrum to illuminate the area on the heat detection going over the threshold. The branches are visible as usual as they reflect back the infrared flash and note the lights in the distance which correspond to houses perched on the hills opposite. The headlights of traffic will often also appear (though it is the branches triggering the IR). Which make wonder what the object in the next three images could be that was moving in front of the camera? It is not in the water, but rather some feet up right in front of the camera. Note the object is bright purely due to its close proximity to the IR flash. It will be some kind of animal, though what is not clear to me. Suggestions are welcome. Other pictures look a bit odd such as this "smudge" picture showing something in the middle of the image. It appeared at the end of a three picture sequence which means it did not trigger the sequence and one may presume that is was something on the lens. The review of the images continues (I am at 3000 out of over 7700 images) and the cameras will be back at their stations later in the year. Clearly, five cameras covering a total of about 330 square metres is a very small portion of a total loch surface area of over 56 million square metres is a long shot, but the hunt continues.